Say hello to the ultimate pizza dessert! With a crispy, crunchy brownie base, a gooey white chocolate sauce and loads of chocolate candy toppings, it’s the perfect dessert for sharing. 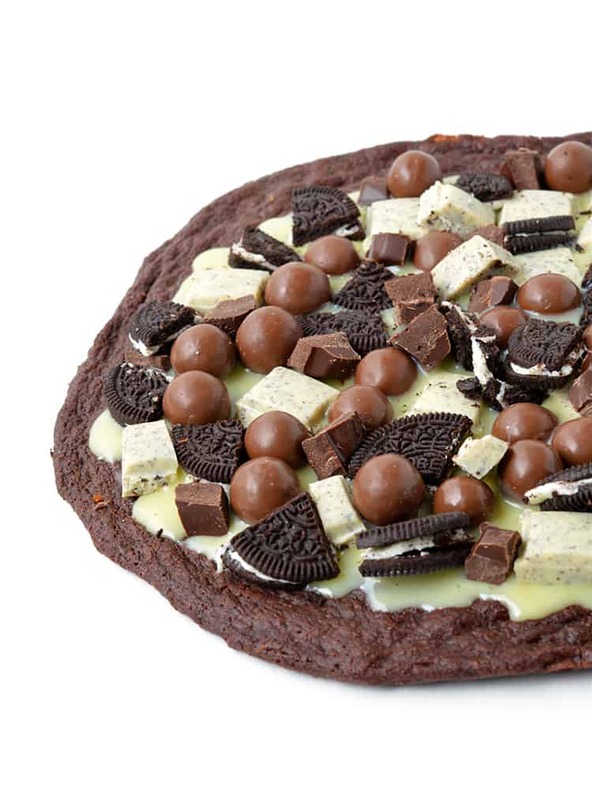 Not a cheesy pizza but one smothered in chocolate and covered in candy? Well it’s HERE. And it looks (and tastes) amazing! 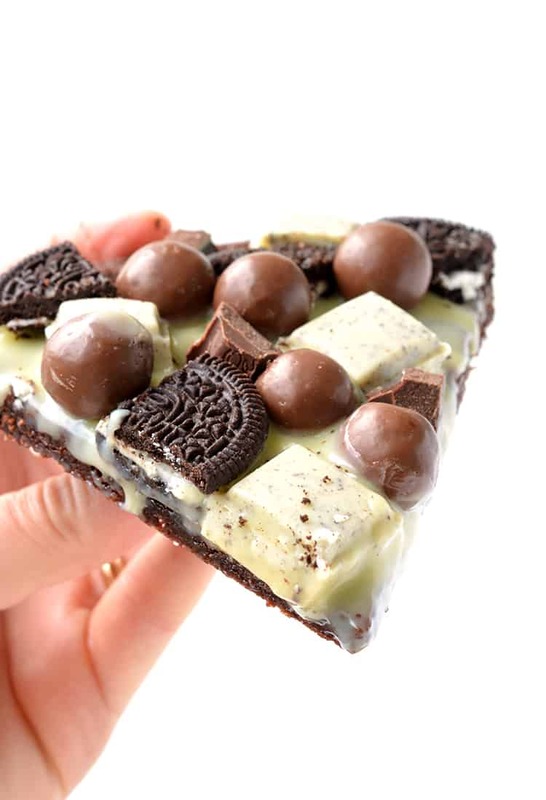 If you love cookies and cream everything, then this is the dessert pizza for you. Dessert pizzas are FUN. Have you ever made one before? 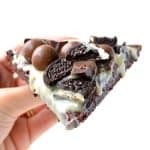 Around Christmas I shared my recipe for M&M Chocolate Brownie Pizza and as I was eating a slice, I thought, oh boy a cookies and cream version would sure go down a treat. 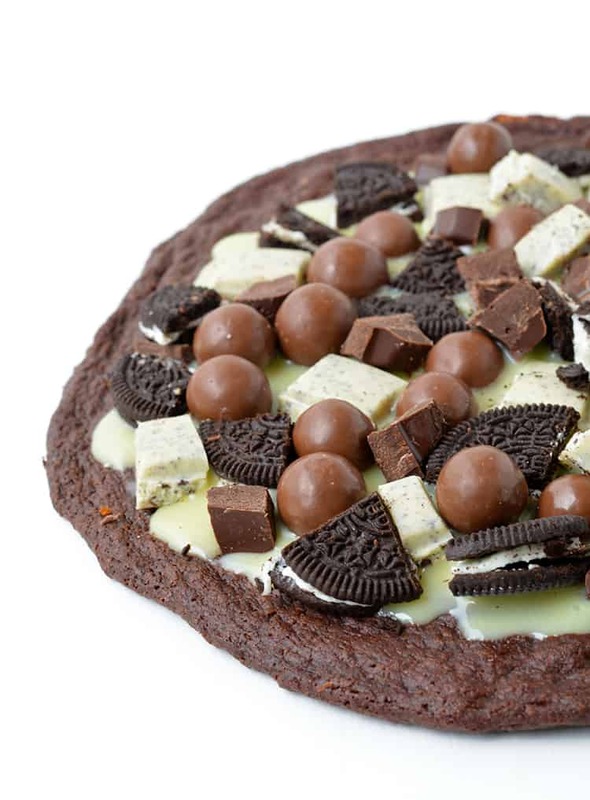 So here she is – my Cookies and Cream Brownie Pizza. 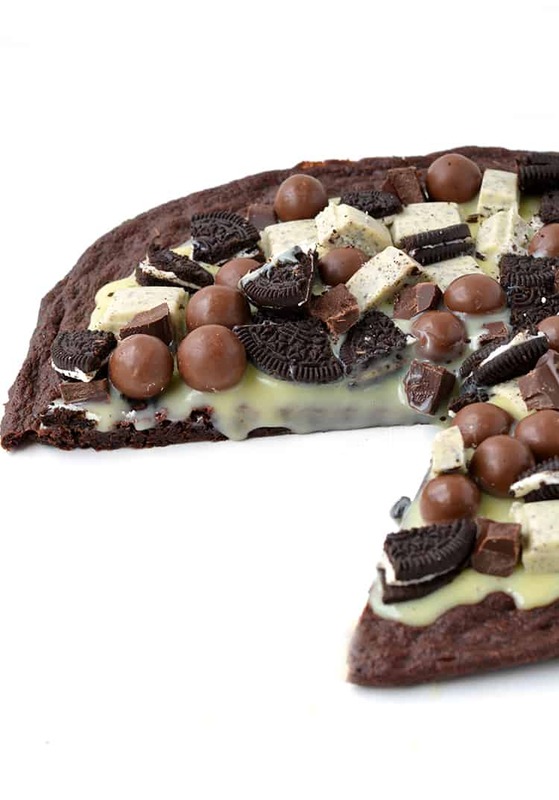 You will LOVE how easy it is to make this brownie pizza. In fact, it’s a really fun activity to do with friends. You could even have a dessert pizza party! 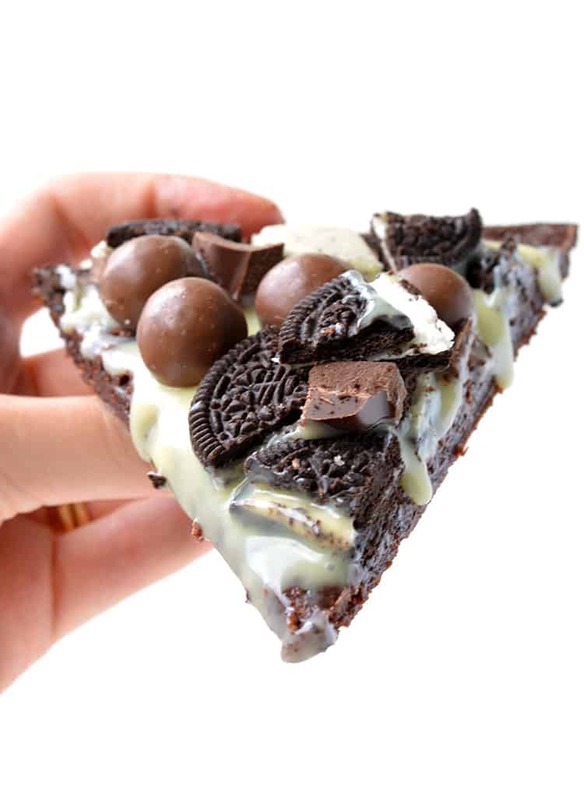 It all starts with the choc brownie pizza base, which is chewy and sticky and perfect for decorating. It’s a spin-off of my brownie bark and it comes together in about 10 minutes flat. Once that’s baked and cooled, it’s time to decorate. And this is where you can get really creative. The pizza ‘sauce’ is a gooey white chocolate ganache, followed by all things cookies and cream! We’ve got cookies and cream white chocolate, cream-filled Oreo cookies, malt balls and chunks of dark chocolate. Hello dessert heaven! So who’s celebrating Valentine’s Day this year? It’s actually our wedding anniversary on the 13th so Val Day gets over shadowed for us – but romance is still in the air! 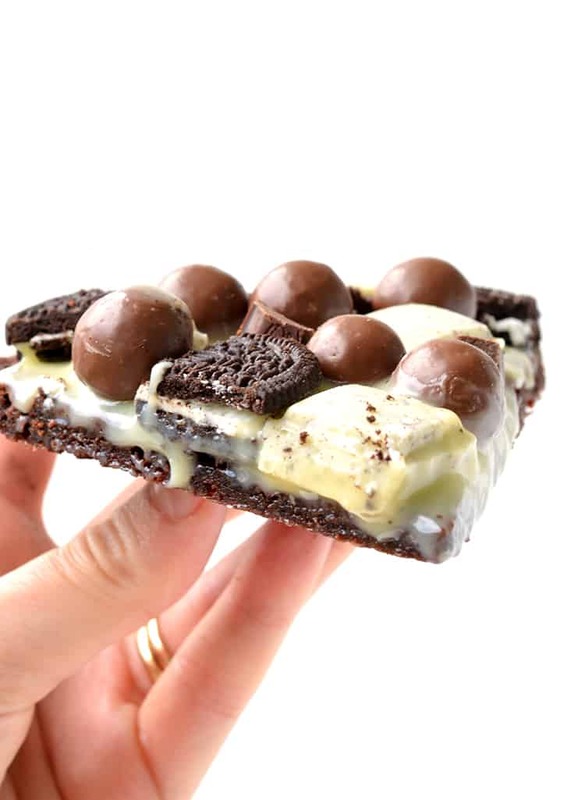 A chewy brownie pizza base topped with gooey white chocolate ganache and loads of cookies and cream candy! Line an oven tray with baking or parchment paper. Preheat the oven to 160 C (320 F). In a large mixing bowl, add the egg white and sugar and whisk together until smooth. Add vanilla and mix again. Then add your melted butter and mix again. Sift in your cocoa powder and flour and gently stir until a chocolate batter forms. Finally, add the milk and vegetable oil and stir gently until smooth. 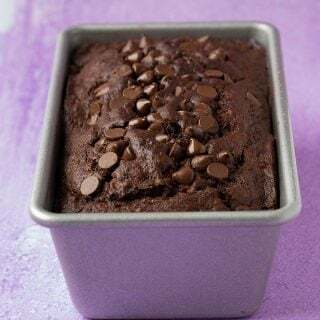 Place your brownie batter onto your prepared tray and spread out to form a large circle approximately 8-9 inches wide. Bake for approximately 15-20 minutes (15 minutes for a more chewy bark, 20 for a more crisp bark). Leave to cool completely. To make the chocolate ganache, roughly chop the chocolate and add to a small bowl. Pour over the cream and the pop in the microwave for 20 second bursts, stirring in between, until chocolate has melted. Put the ganache in the fridge for about 15 minutes to thicken slightly. 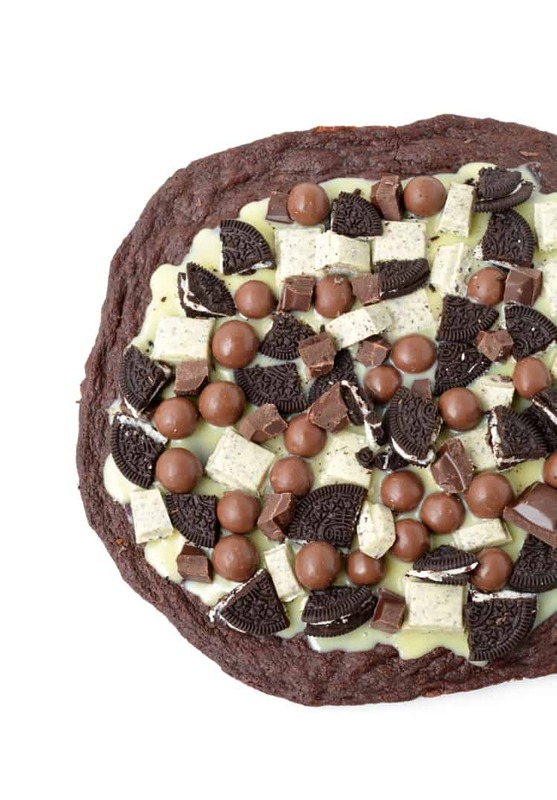 Spread the ganache over your pizza base, then press your chocolate, Oreos and candy on top while the chocolate is warm. Leave for 10-15 minutes for the chocolate to set, then cut into slices. Hii! This looks amazing! Can’t wait to try it. 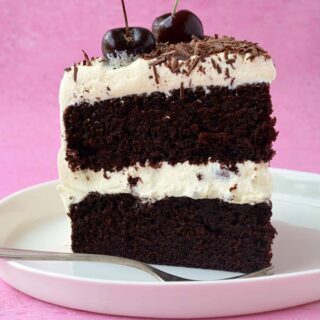 Is it possible to make the brownie base without egg white? Or can I use my egg free brownie recipe instead? Hi Mansi! I’m sorry but I haven’t tested the recipe without the egg white so I can’t confirm the results. 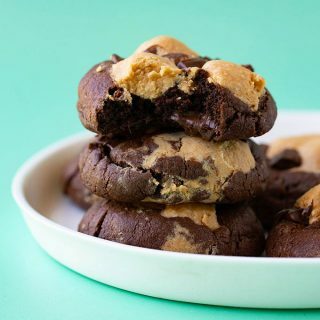 It’s a very thin and chewy brownie base so a regular brownie would be different – not as pizza crust-like. However I’m sure it would still be delicious with all the toppings! Holy crap, Jess! This looks amazing! I love cookies & cream anything, and this would probably top my list! !